What Does It Mean To Kneel? I watched football once. Well, maybe four or five times, accidentally, since sometimes the TV was in front of the snack table. Basically, I don’t know much about football. But I do know a little about symbolism. The act of kneeling has a rich body of connotations from pure subordination to reverence to supplication. A person typically kneels in deference to something, whether literally or metaphorically. Whatever that something is, the implication of the kneeling is usually that the kneeler is acknowledging, resigning to, or yielding to the power or glory of that ‘something’. And while I know way more about bean dip than football, in a societal context, I sure as hell know what football players symbolize: MASCULINITY. American football players are immense, muscled, unyielding, high energy, powerful, animalistic. They are Men, with a capital “M”. 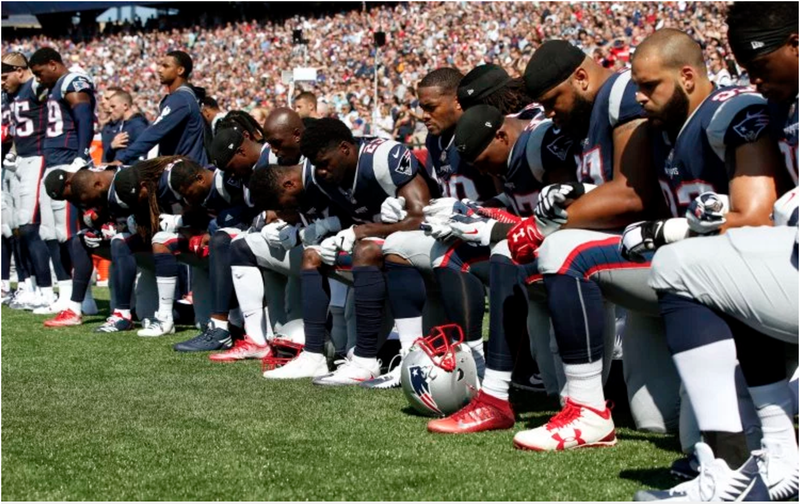 So what is the effect, symbolically, of football players… kneeling? Notably, the contrast intensifies the power of this protest. The kneelers, the ones engaged in this gentle, submissive action, are the very men who Americans have cast as the apex of male dominance, as modern-day gladiators. If these men had bent over and mooned the flag throughout the national anthem? Ok. If they had flipped the flag off? Alright. If they had all chosen to sit? Perhaps then there would be more ground for ferocious ‘disrespect’-based attacks. But these men are kneeling. Their physical action, the grace of which is made even more evident by their status as glorified representatives of hyper-masculinity, is arguably more reverent than standing. The kneelers’ platform (i.e., their place of employment), their occupation (i.e., athletes who perform for the entertainment of others), and their income (i.e., a whole lot of money) are often just red herrings. Only two other symbols seem to be at the core of this discussion. The first is the kneeler’s blackness, which itself is a potent symbol in the United States with its own rich, devastating, inspiring history. The second is the American flag and, in tandem, our country’s anthem. Viewed as performance art, physically strong black men kneeling silently before the American flag as the anthem is sung makes for a breathtaking statement. The construction of this protest is brilliant in its simplicity: The kneeling men uphold the tradition of the anthem, they respect the flag throughout, and then they perform all their job requirements. Yet for a brief minute or two, as they kneel, we as viewers are forced to ask ourselves if these men are as American as any other American. Because if they are, then here before us are our own countrymen, literally fallen to their knees before the most encapsulating symbols of our country, pleading for our ears, our eyes. Their kneeling is not a snub to the flag. It is an appeal to it. Hear, hear! I can’t see how anyone would argue against this, but there are so many things I don’t understand. Thank you for writing this post. Good luck in your effort to make sense of the mess, and keep on being the light that you are. I have been looking for someone to say this.Thank you for this perspective. This was resonating in my mind today.. I was putting the pieces together to follow this path… but found you had done a great job already… Thanks… I will share it. So glad you wrote about this. I’ve been trying to understand why people keep saying that the NFL players are “disrespecting” the flag when in reality, kneeling is an equally powerful – if not more powerful – symbol of reverence. Since when is standing more respectful than kneeling? It’s not; they’re different yet relatively equal gestures of respect; depending on the context, one may be more “traditional” than the other but it doesn’t make it better or worse. Talk about getting the facts wrong. I think it was an excellent choice for a peceful protest gesture. Lovely, the perfect explanation. I got choked up just thinking of how deeply felt these issues are.